If you are looking to buy a decent laptop today, you have enormous amount of options now. Thanks to the competition among the manufacturers. In the fray, HP has decided to satiate user’s multimedia desires with their new addition to Pavilion series; the dv6t. The dv6t notebook is housed with Intel’s Core i series processor and excellent multimedia offerings. Let us take a look at the technical specifications and notable features of HP Pavilion dv6t. Sporty look of dv6t pulls users towards it. Brushed aluminum lid with glassy finish makes the notebook look regal. Dark umber finished lid and the thin silver speaker panel sits nicely between the aluminum hinges. Considerable spacing between keys and wide palm rest allow users to type rapidly avoiding silly spelling mistakes. Another considerable improvement is the function keys for adjusting volume, brightness etc are now the Direct action keys, that means you do not need to keep holding the Fn key. The touchpad, which allows multi-touch gestures, is comfortable to roll fingers on. If you find typing passwords for logging into sites that you frequently use is boring task, HP has offered you solution with its Fingerprint reader. Though this feature is not alien to world, to have it in multimedia notebook is unique. One can log into sites like Facebook with swipe of finger. The notebook features HP SimplePass that permit users to generate one time passwords for financial sites like PayPal. 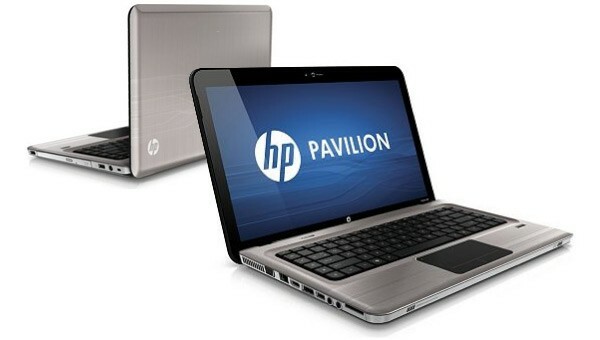 HP Pavilion dv6t is made for excellent multimedia experience. Thanks to vivid LED display and Beats Audio, notebook stands strong on all expectations. 15.6” LED display with 120 degree viewing angle offers ultimate viewing experience. Beats audio adds to the excitement of watching action packed thrillers by allowing users to hear hidden background sounds in the playback. HP Pavilion dv6t features one of the best configurations possible these days. Notebook is excellent performer in its class thanks to second generation core i processors from Intel. Thanks to the memory capacity of gadget, one can run different applications at a time with all of them running smoothly as of butter. Pavilion dv6t features switchable graphics that are primarily used to maintain power consumption while device is not plugged in to direct supply. In addition, these graphic cards make wonders for gamers running high graphic demanding games without any hiccups. With moderate frame rate on different resolutions, dv6t performs best in its class. HP pavilion dv6t is available for $769 with company configuration. However, economical version of the device is also available in market that houses Intel Core i3, 500 GB hard disk, 4 GB RAM and Intel HD 3000 Graphics. Latter one doesn’t come with switchable graphic card facility. Let us take a look at technical specifications of the gadget. The dv6t notebook from HP is certainly a “beast” when it comes to multimedia usage. With its incredible power and graphics capability, it is hard to say no to it. So if you are looking to buy a multimedia notebook, just grab it without a second thought. I am freelance content writer from India. Technology, Gadgets and web is what stimulates me.